Google Maps now come indoor as well as outdoor. 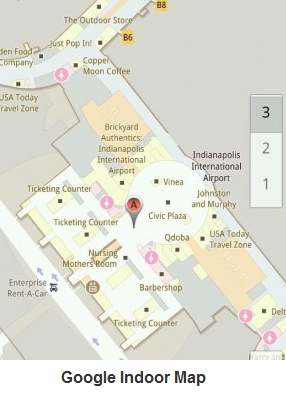 You can get a map that’s the floor plan for an airport, a mall, or retail store. The maps come in on any Android phone or tablet. Just keep zooming till you get there. Google Maps has had indoor maps before, but they were a bit fuzzy on details. The maps still don’t have a search function, so if you’re looking for a restroom, say, you have to zoom around. Not every store has uploaded indoor maps yet, but there’s a long list of those that have: Chicago’s O’Hare Airport, Macy’s, Home Depot, IKEA, Bloomingdales, etc.